Staying at the Hotel Aurora you will also have the opportunity to add to your holiday a tasting on the Amalfi Coast, made up of typical and local products, to enjoy fully all of the flavours of Amalfi and the surrounding area. (*) Welcome pack for those who choose our apartments: welcome package with a first shop ready in the fridge for your breakfast in Amalfi plus free laundry service. The wine that we will offer you comes from a famous vineyard hanging on the terraces only reachable by many steps. The floral aromas are mixed with the salt air of the sea breeze which gives the wine its unique flavour and body. If you are tired of the usual Pinot Grigio, the Costa can offer you wines that you will never forget! The food is produced locally and cannot be found in the supermarkets of the big cities such as the dairy products of Agerola, just 15 km from Amalfi. They use fresh milk from the area and the province: fiordilatte, smoked provola, caciocavallo, provolone del Monaco … The best food on the coast and the best way to sustain our local economy! Are you intrigued by the name of the provolone del Monaco? Legend says that in the surroundings of Vico Equense, in Arola, there was a convent with the monks and near the convent a dairyman assisted by his beautiful wife during provolone making . The cheesemaker died and one of the monks felt pity for the poor widow and day and night helped her to make Provolone cheese itself … Provolone del Monaco! In our tasting on the Amalfi Coast you can also find ‘taralli and freselle’, durum wheat and rye bread, with sourdough, cooked in the oven for 12 hours then soaked in water, served with oil, cherry tomatoes, oregano, garlic, salted anchovies, rusk bread widely used in the Middle Ages during the long months of navigation by sailors who often had no other food for feeding themselves. Even today, in the houses of locals ‘taralli and freselle’ Amalfitans never fail, for a quick lunch or a snack for snack. 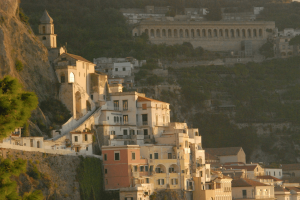 Try them too living the experience the true life in true Amalfi Coast! To enjoy this Amalfi experience, simply add the dedicated add-on when booking from our Official Website! We are waiting for you on the Coast!